After years of dire tidings, the news this year about California’s chinook salmon all sounds good. Federal fisheries biologists have predicted big numbers of Sacramento River fall run chinook–the state’s biggest, most commercially important salmon fishery–and the biggest population of Klamath River fall-run fish in memory. The California Salmon Council, a commercial fishermen’s group, forecasts a harvest of 3 million pounds this year. That’s triple last year’s take and represents a comeback from the Great Salmon Crash of ’08-’09, when the sudden collapse of the Sacramento fall run forced state and federal officials to shut down salmon fishing two years in a row. Salmon fishermen who barely hung on through the crash, along with those who sell them gear and supplies and process and market their catch, can look forward to something like a prosperous season. Yes, that all sounds good. But here’s the rest of the story. Let’s start with that commercial harvest number. We won’t really know until later this year how the season turns out, but that 3 million-pound catch is only impressive next to the recent string of disastrous salmon years. The forecast for this year is nearly one-third lower than the average yearly harvest for the decade before the crash. And National Marine Fisheries Service data shows the catch has been slowly dwindling since 1950, with a more rapid decline starting in the late 1980s. But nothing prepared fishing communities, scientists, or interested onlookers for the population crash that took place in 2008. Everyone would still like to know why it happened. Scientists have studied factors from water pollution to a big bridge project in the Carquinez Strait–did construction noise harm out-migrating juvenile salmon?–without identifying a single factor. The consensus is that circumstances ranging from poor ocean feeding conditions to water diversions from the Delta played a role. But this is a mystery with an answer hiding in plain sight. Once, salmon returned by the millions each year to the Bay, the Delta, and the rivers and streams in the Central Valley. Napa Valley pioneer George C. Yount recalled the region between San Pablo Bay and Sutter’s Fort (in present-day Sacramento) as one where “the Rivers were literally crouded [sic] with salmon.” And there’s plenty of pioneer testimony that echoes that description. What changed? Just everything, starting with the Gold Rush, which brought forth fabulous wealth and wrought unimaginable environmental destruction to salmon streams. And then dams, cities, farms, and industry. In a word: Us. Even some efforts to preserve commercial chinook salmon populations may be hurting rather than helping the fish. 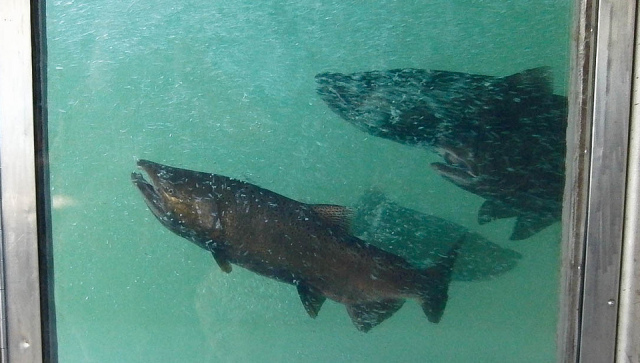 When the Sacramento River fall-run chinook population collapsed a few years ago, it happened despite a long and aggressive effort to use hatcheries to replace spawning streams destroyed by dams, logging, and development. But the heroic effort to improve on nature—even trucking baby hatchery fish downriver so they can avoid predators, polluted water, and Delta pumps—could be exacting a toll on the long-term fate of the run. Some biologists believe that the combination of habitat loss and hatchery production has essentially wiped out the last truly wild Sacramento Valley fall-run chinook. 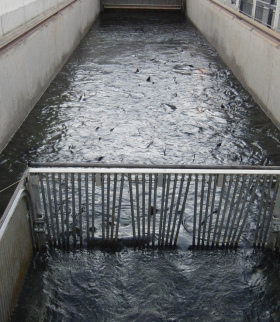 Worse, the surviving hatchery stock lacks the genetic variety of wild fish and could be more vulnerable to changes in ocean conditions or disease–and thus more prone to collapses like the crash of ’08-’09. 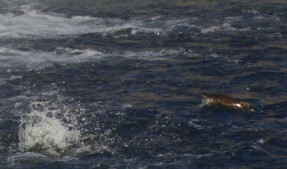 Is there anything hopeful about the salmon’s story in California? There is. Over the past twenty years, government and resource managers have taken the first steps to restoring both water and habitat for chinook salmon. One of the most publicized actions—a limit on pumping from the Delta at certain times of year to protect threatened salmon and other species. That action was prompted by an environmental lawsuit, and it prompted a wave of lawsuits from farm and city water users south of the Delta. Outside of court, both the state and federal governments are working on plans that are supposed to restore the Delta and its species while delivering the water that farms and cities expect. Doing that will take a lot of money and determination. The chinook can’t help with the cash, but they may provide a lesson about persistence. As a species, they are the product of millions of years of evolution. The few wild fish still out there have been doing what they do, sometimes climbing thousands of vertical feet out of the Central Valley to their home streams, for a very long time. They are engineered to deal with disasters on their home streams and famine at sea. Given half a chance, they not only survive, but thrive. Fortunately or unfortunately for them, they now depend on us for that chance. What say we charge 3x as much for our water to go south and We won’t whimper if a melon cost $.25 more. At 3x the cost I am sure our good farmers AND the mega-corporations will find viable ways to use less. Prev Bay-Friendly Gardening: Welcoming Wildlife and Nature Into Human Habitats Next California's Deadlocked Delta: Can We Bring Back What We've Lost?